What Pool Cleaner is Right for You? With so many options and brands on the market, choosing just one pool cleaner can be overwhelming. Today we’re going to review different products to help you decide which is best for you. 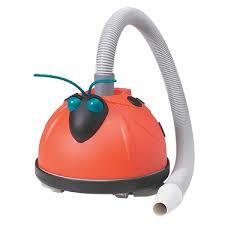 There are three types of cleaners; a suction-side pool cleaner, a pressure side pool cleaner, and a robotic cleaner. 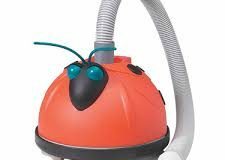 For the purpose of this post, we’re going to primarily focus on the pressure-side pool cleaner and the robotic cleaners, as well as give examples of products we recommend. While the suction-side pool cleaner is a lower cost than the other two, it also causes additional wear and tear on your pool pump. Overall, it is much more taxing on your pool filter system. However, it can be great option for smaller, above ground pools. If you do have a smaller, above ground pool you could consider the AquaBug. The AquaBug is an attractive and compact cleaner, and is designed to clean the bottom of pools of all shapes and sizes. It features the Hayward exclusive SmartDrive program steering, so it won’t miss a single spot. A pressure-side cleaner is driven by water pressure from a dedicated booster pump or pool pump. The pressure pushes the cleaner around your pool and forces the debris into a filter bag, from there it can be collected and easily removed. 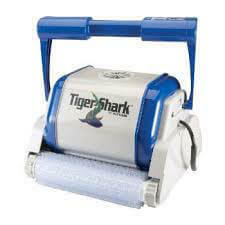 These cleaners are great for medium to large pools and uses less pool filter and pump maintenance. They often have many replacement parts available, this can extend the life of the product. 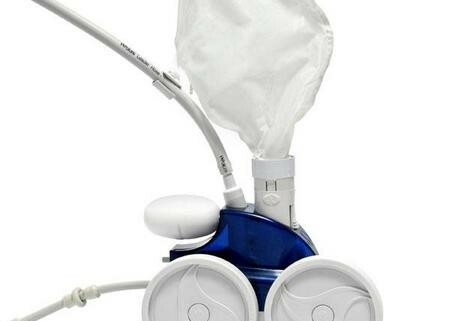 With this type of cleaner though, they generally require that you have a second pump or booster pump. If you’re interested in a pressure-side cleaner, we recommend looking at the Polaris 380 if you have an in ground pool. The Polaris 380 features an all-wheel, belt drive mechanism that provides greater vacuum power and faster cleaning. 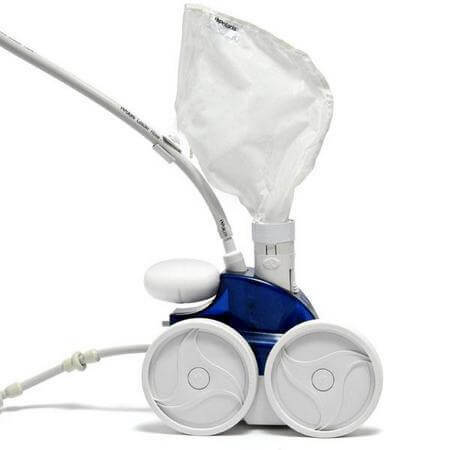 Powered by triple jets, the cleaner sweeps, scrubs, and vacuums the bottom, walls, and steps of the pool and holds debris in its single chamber filter bag. Its unique filter bag removes debris before it reaches your pump basket or filter, prolonging the life of your filtration system. Robotic cleaners are the most popular choice among buyers and distributors alike. While they are generally the most expensive option, they have a self-contained filtration system so they won’t put any additional wear and tear on your existing pool system. They’re easy to use; just plug them in, submerge them in water, and press power. Most high end models will even clean the pool walls for you. Debris is pulled from the floor and walls with suction power and the unit deposits it into a self-contained filter instead of going through your skimmer or pool filtration system. They’re most recommended despite the higher price because they’re energy efficient, operate quietly, they have longer warranties, and they give your pool a better overall clean. 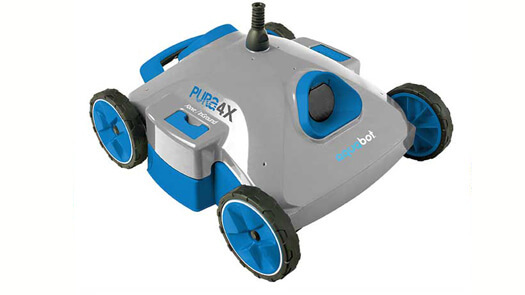 If you’re interested in a robotic cleaner, we recommend the Aquabot Pura 4X for an inground pool, or the Hayward TigerShark for an above ground pool. 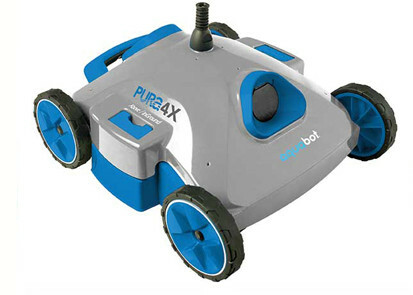 The Aquabot is designed for faster and more accurate cleaning. It features some of the best cleaning functionality and has a sleeker design to allow for maximum maneuvering and allows you to enjoy your pool more verses worrying about it. It is equipped with Hyrdo-Robotic Technology and is compatible with an external timer. 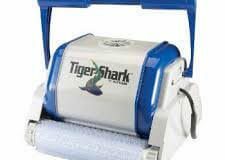 Featuring an intelligent microprocessor-based technology, the TigerShark family of robotic pool cleaners is recognized for its superior performance and efficiency. Loaded with industry-leading technology, it makes sure every inch of your pool gets that much cleaner, and is no exception with a fast cleaning cycle. At Aqua Leisure, our staff can give you expert advice on all of these products and more. So if you’re not quite sure about what pool cleaner is the best fit for your pool, be sure to visit one of our five locations in Hampton Roads to have all of your questions answered. With a collection of pool equipment like ours, there’s sure to be something for every pool! Don’t forget, while you’re in, you can also get a free water test to make sure your pool water is ready to go!